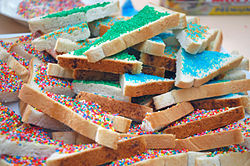 Fairy bread is sliced white bread spread with margarine or butter and covered with nonpareils (aka hundreds and thousands), served at children's parties in Australia and New Zealand. It is typically cut into two triangles. Fairy bread dates back to the 1920s in Australia, and is first recorded in The Hobart Mercury, which describes children consuming the food at a party. The origin of the term is not known, but it may come from the poem 'Fairy Bread' in Robert Louis Stevenson's A Child's Garden of Verses published in 1885, and had been used for a number of different food items before the current usage. ^ Stott Despoja, Shirley (29 March 2012). "Bread And Butter And Nonpareils". Adelaide Review. Retrieved 24 April 2016. ^ "Christmas Dinner with the Toddlers". 15 December 1936. Retrieved 29 November 2018. ^ Jacky Adams (6 February 2009). "The War Against Fairy Bread". Sydney Morning Herald. ^ Ursula Dubosarsky (2001). Fairy Bread. Mitch Vane (illus.). Penguin Books. ISBN 978-0-14-131175-3. ^ a b "Australian Words: Fairy Bread", Australian National Dictionary Centre, ANU. ^ "Meanings and origins of Australian words and idioms", Australian National University. Retrieved 12 August 2016. This page was last edited on 2 April 2019, at 08:06 (UTC).